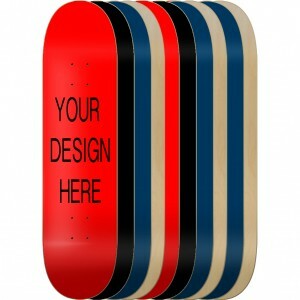 DESIGN YOUR OWN SKATEBOARD SPEND LESS GET MORE FACTORY DIRECT! In design studio you can pick the sizes 7.5 7.6 7.75 7.8 8.0 8.125 8.25 8.5Make a Mural for your w..
We will MEET OR BEAT any advertised price. 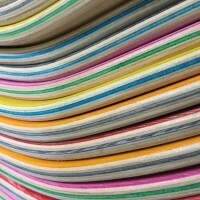 The best place to design your own skateboard is here due to our state of the art manufacturing facility. Our competitors just can't match our come close to our prices. 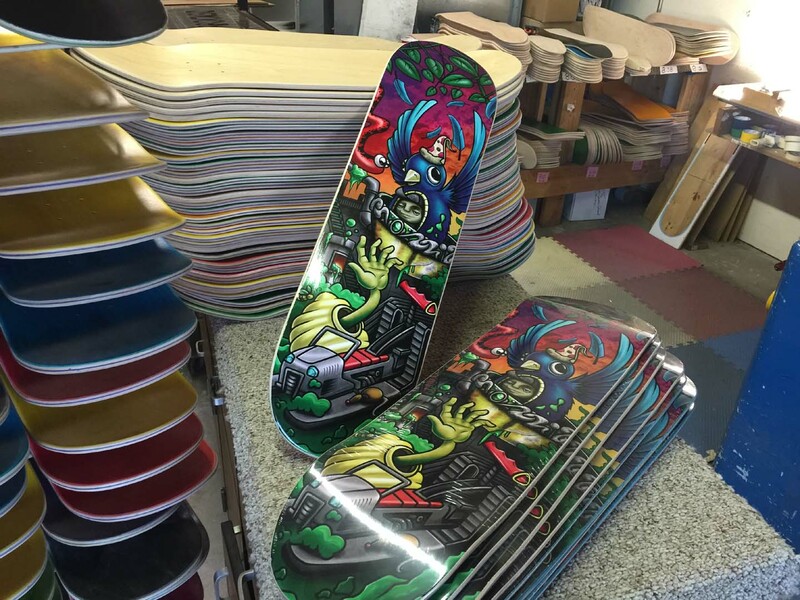 The lowest price in the industry for designing your skateboards online single or bulk wholesale options. While others claim the are in the manufacturers category it is clear they are not due to the prices they are trying to make you pay. We are fair and want to help you the consumers get the best possible honest price. At one point or another all but one company has called us up wanting us to drop ship their orders while at the same time competing with us. 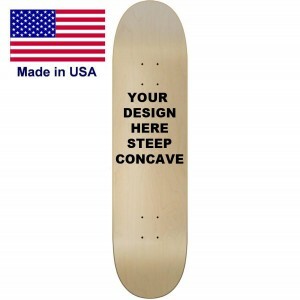 We are a manufacturer and yes they can have a website offering custom skateboards but they can't offer the American made skateboards for the same price or lower. We don't just give you WHATEVER deck we can find on the net. We actually build the board from ground up. Starting with the glue and veneer. 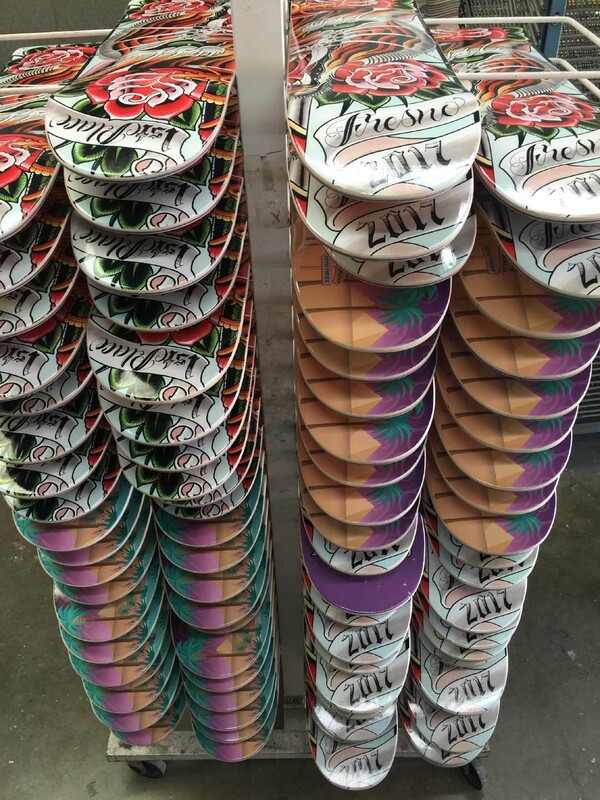 Each deck is pressed at our facility with the best glue that was made specifically for skateboards. The veneer we use is brought in by railway then put on a sixteen wheeler to deliver to our factory. Not all manufacturers are using the proper glue to press up decks. 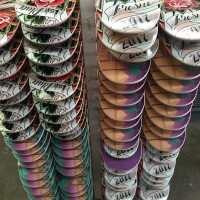 We have seen many of them switch away from the glue we use because of a lower price adhesive that has been taking up a majority of the skateboard manufacturers production. We are loyal to our suppliers and have tried other adhesives but we don't sacrifice quality for price. Since we started making skateboards back in 1995 we have kept the same price list for over 20 years. Even with rising material, labor, freight, utilities and other misolanious supplies needed to make the best skateboard in the world. 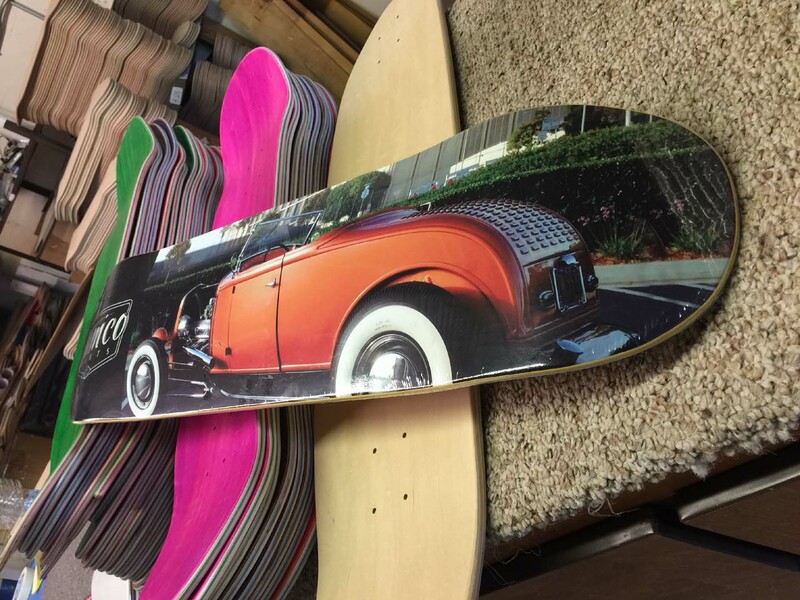 When it comes to skateboard printing we are the pros. You name it we have printed skateboards every way known to mankind. This was one of the most challenging ways to print a skateboard. Personally I loved this process and it gave me and my employees a great deal of satisfaction with the final product result. There is nothing better then spreading the ink on the board with a squeegee. It feels like magic the board goes in and with a wave of a magic squeegee the board comes out with a color on it. 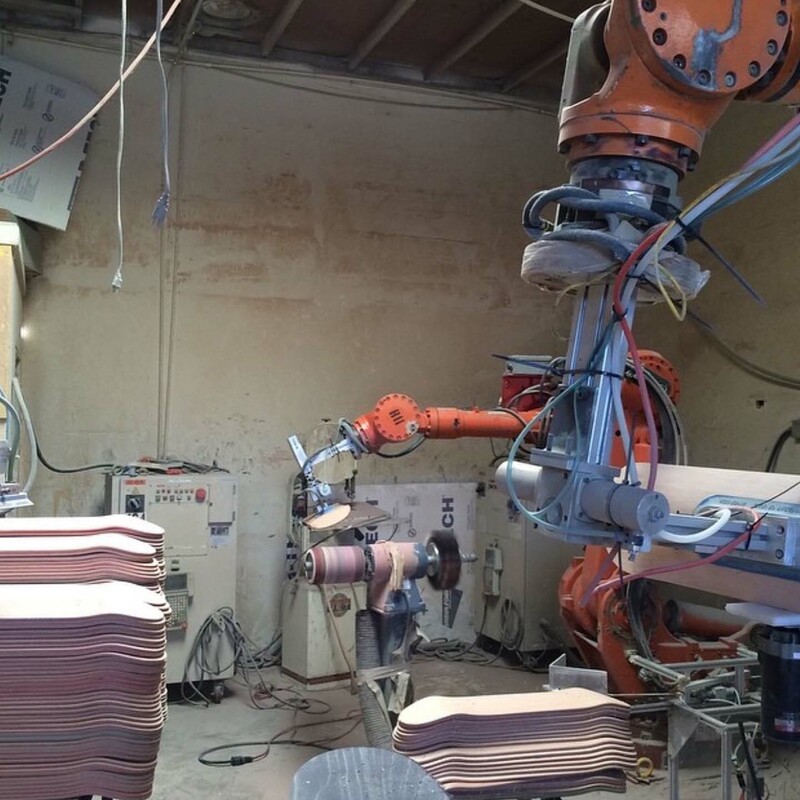 By the time the last color is placed on the deck the personal satisfaction overwhelms the factory. 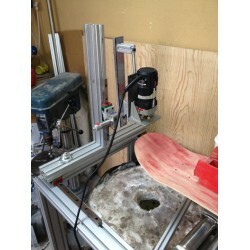 It is also the fastest way to print a skateboard but also the slowest setup process along with a high set up cost. Mixing the ink according to pentanes and separating the colors in the computer was extremely time consuming. Don't forget about trapping the colors this is always a challenge that most people don't understand so we would have to do it for them manually. Making the screens and burning the images into the screen frames was fun but also time consuming. Screen Printing Skateboards is extremely fun until its not. Eventually the fun wears off and it is a painful task. The repetitive motion of pulling a squeegee over a skateboard starts to wear you down and is also a health hazard. The fumes from the drying ink smells good to some. I personally like it and till this day we still do some screen printing on skateboards from time to time and it brings back memories. 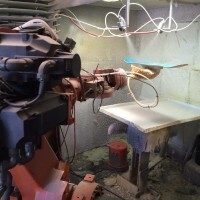 This is also a really cool way to perform the skateboard printing process. Sublimation is where ink is printed on a special paper. The paper is then placed on a surface and pressed with high heat and pressure. It was a spark to creating photographic prints on skateboards. Back in 1992 we were sublimating skateboard graphics and we were the only ones doing it. Sublimation was printed on the special paper with a inkjet printer so the detail and photographic images were achieved with great accuracy. Still to this day we get people asking if we do sublimation. We could because we have but the color is not as vibrant as the printing process we developed. When sublimation happens the ink turns to a gas while in the heat press and transfers to the surface it is pressed against. During this process there is ink left on the paper so it it clear that not all the ink is transferred onto the surface. Another bad thing about sublimation printing is that the veneer is what goes into the sublimation press. Skateboard veneer is best when it has a certain amount of moisture content within the wood. 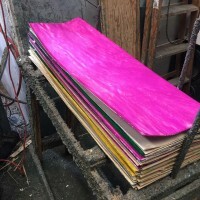 Putting a ply from a skateboard in a sublimation press will take the moisture out and make it more brittle and will take its rebound strength away making it a weak layer in the skateboard deck. 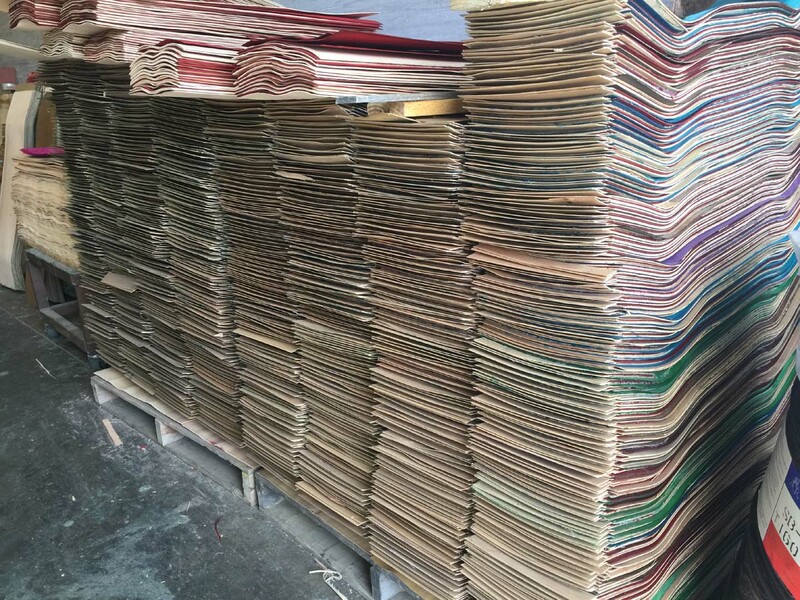 Back then the decks were still built with the same glue we used to this day and even with that one layer having gone under those extreme pressure and heat the deck was still better then the decks that come from some of the largest brands in the industry. WHAT? Overseas manufacturers use a heat press to speed up the process. The board gets pressed with heat to cure the glue to speed up the time the board is in the press. Anytime wood is subject to heat it looses it's moisture content making it like a dry tree branch. A dry tree branch will snap easy while a branch that is still sucking water from the earth will bend and bounce back. Same concept applies to a skateboard. We don't use a hot press we press the deck in a cold press with glue that dries on its own time. No need to rush the manufacturing process in order to make a buck. This is still new to the market and has opened up a door for new brands to hit the market. 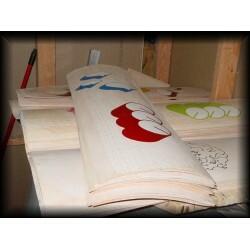 There are many ways to make a heat transfer for skateboards and we have also done them all. With all the experience we have behind us trust that we are doing it the correct way and what is best for the market. 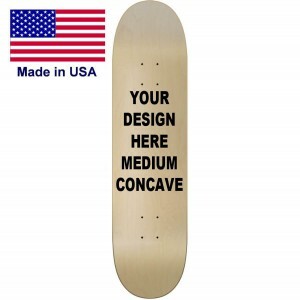 In the above conversation about sublimation printing first thing that comes to mind is heat applied to a skateboard. 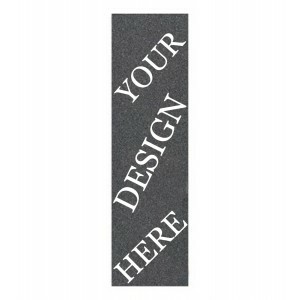 This Heat Transfer Printing On Skateboards does not require the skateboards to go under the heat and pressure for as long. During the heat transfer process the board does not spend enough time to expel the heat. Actually the moisture is trapped in the deck while going through the heat transfer machine. A heat transfer is a sheet of plastic placed on a board and the roller of the heat transfer machine pressed the plastic against the wood. The ink melts into the wood and the wood has no way to release any moisture from the deck. The plastic traps in the moisture while going through the heat transfer machine. 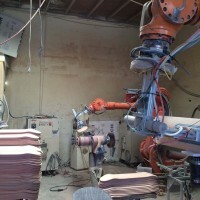 The veneer ply surface is the only place where heat is applied unlike sublimation where the veneer is in a press under pressure for a minute or two. 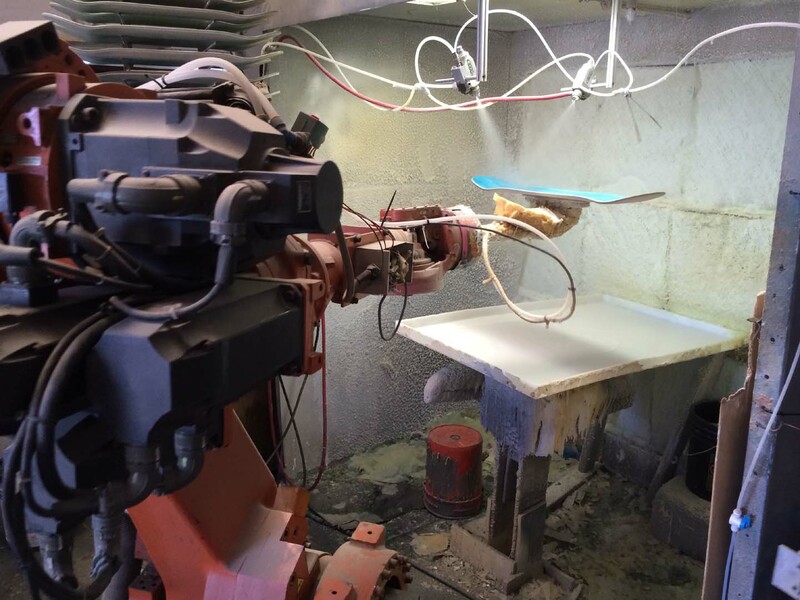 The heat transfer machine only takes seconds for the ink to melt into the wood. Another positive note is that the board is already sealed with lacquer so the protective paint is in place to seal in the moisture as well. 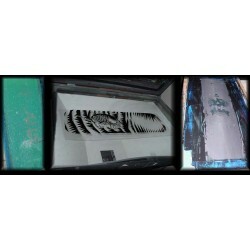 The sublimation process is done before even going into the skateboard press. When the heat transfer come into the market we wanted to talk all kinds of trash on it because we were screen printing and were not looking to change. With the push of our customers request we made the change and found out all the good things that come along with it. 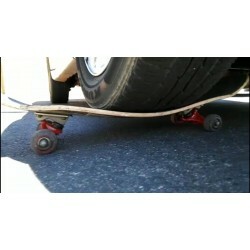 Let me tell you this that heat transfers can also DESTROY a skateboard structural composition if not done right. 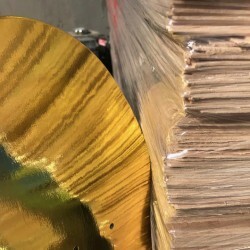 There is a small window of opportunity that allows for a heat transfer to be applied without hurting the structural composition of the skateboard. MOST important thing to remember is this. The following scenario is based upon science and common sense of how skateboards are made. 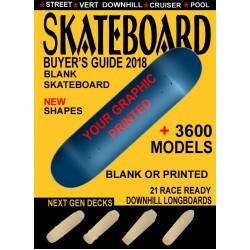 I am going to give you info about what I know about one of our top competitors and what they have to face to bring you a skateboard with your graphic on it. 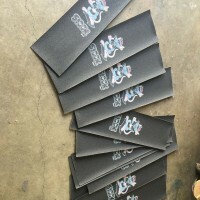 Not going to mention names but I am sure you will be able to find out for yourself who and what kind of companies use this heat transfer technique to process your orders. Lets get started. So a company that does not press their own decks have a disadvantage when it comes to heat transfers on skateboards. The biggest problem they face is moisture content. 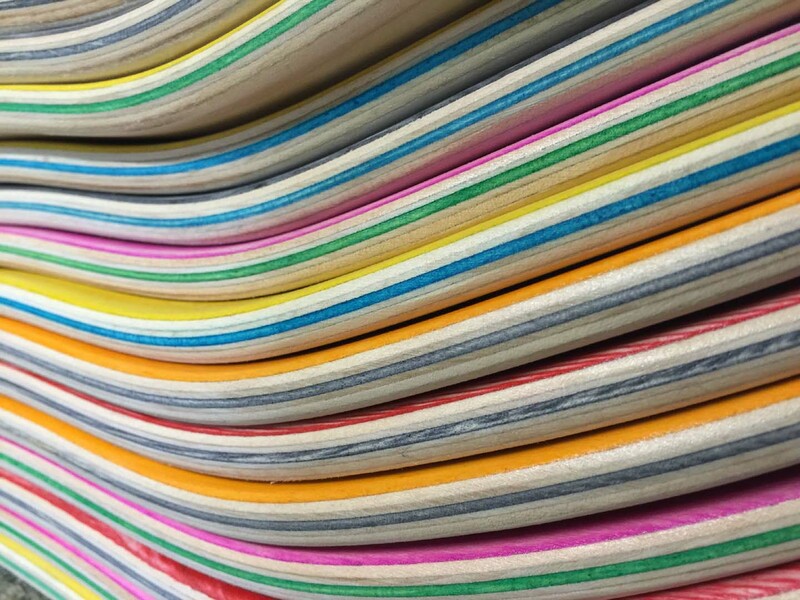 Moisture content is a make or BREAK when it comes to skateboard manufacturers. Common knowledge tells us that wood with moisture can withstand more flexing then a dry tender wood that will snap with bending of flexing. So a skateboard made overseas is mad it takes a month to arrive at the port of California. Once the wood gets here it is then put on a eighteen wheeler in order to take to the so called manufacturer. 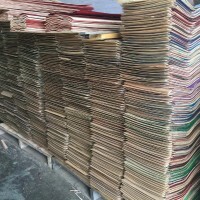 Then the company puts the decks into inventory and we are talking about thousands of decks stocked up in shelves. Depending on where this so called manufacturer is that is buying these overseas decks are located will determine the life of a deck. If for instance a company is located in the DESERT! with dry hot heat the decks will further dry out over time. This is where it gets good or wait it gets UGLY. The dried out imported deck is then put through a heat transfer machine to press your graphics on. What do you think happens. I know what happen the board will make noise going through the heat transfer machine. It cracks and pops and if the board was not laminated properly it will delaminate. 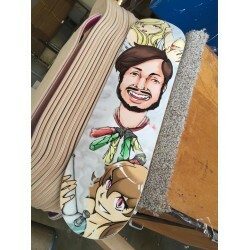 I have had customers bring me imported decks to put their graphics on and every time the board makes a loud sound in the heat transfer machine. Most of the time you will then look at the deck and find that the top ply has pressure cracks in it and what does a supplier do at that point. Well with us that never happens because our decks are made fresh to order. When a deck is made fresh to order the wood still has its moisture content in the veneer. It can flex and let me tell you decks flex in a heat transfer machine. Having a fresh deck in a heat transfer machine will not crack or make noise. The moisture content protects the skateboards from loosing its pop or breaking down the structural makeup. The conclusion is that a fresh made deck made to order will hold up longer and the pop will last longer. A dried up under pressure deck might feel nice for a day or two but who wants a deck to last a day or two? We don't make decks for you to break them and buy more we make them so you can build a reputation of having a GOOD Skateboard Deck under your feet. 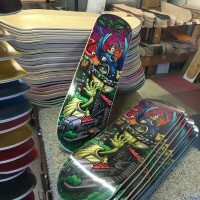 We are a manufacturer in the United States of America and are busy enough with making decks we don't need to make more at a mass production volume. 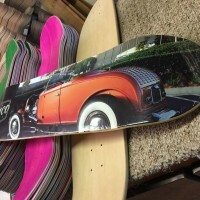 We strive on making a board that last so we can satisfy other customers while you and your team are still skating on the deck we sold you months ago.